I'm doing a WIP Wednesday post on a Sunday, but I wanted to share my progress with you guys. Hurricane Sandy is coming this week so I'm anticipating a bit more time for knitting, and I wanted to post these pictures before they became irrelevant. The reason I forgot to post this Wednesday is that I've been working on my study abroad plans for next semester! I'm officially studying in Granada, Spain this Spring and it hasn't really become real for me yet. I'm very, very excited, but I am definitely going to have some separation anxiety from my friends at school and from my family. I'm hoping I'll just be having too much fun to have time for homesickness! 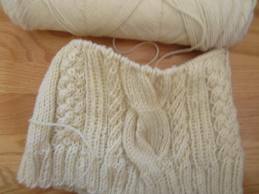 In the meantime, I am trying (once again) to design my own sweater. I bought the Fishermen's Wool and decided on a bottom-up chunky cable knit. I haven't decided yet if I want to do raglan sleeves (I recently bought Knitting Without Tears by Elizabeth Zimmerman - My knitting life has officially been changed) or set in sleeves. 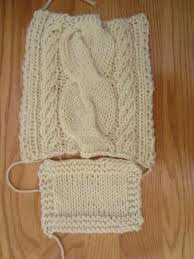 Well, I ripped it out and started fresh, but all I currently have now is the ribbing. The second WIP is my Inspira. This is incredibly fun to knit and I see myself wearing it all the time (as long as the Lionbrand Amazing isn't too scratchy). I hope everyone had a great pre-halloween weekend! Study abroad? Woo hoo! You are going to love it! I love the Inspira, the color changes work so well with the pattern. Keep safe during the storm! Thanks Pumpkin! Thankfully, Boston isn't as in line for the storm as NYC and New Jersey area. Wow, Granada! Everyone I've ever met who's been there has fallen in love with it, so I hope you do too! That sweater looks like it's going to be amazing and perfect. EZ is so liberating! Hey! I'm studying abroad in Barcelona in the spring! : )We should practice our spanish together! Your knitting looks beautiful, too. Thank you!! And we should definitely practice our Spanish! If I ever make it to Barcelona you'll have to tell me about all the great yarn stores you've found! Thank you! And I'm sure you're right! I've finished my Inspira (still trying to get pics) and I love it - you should definitely put it to the top of your knitting list!